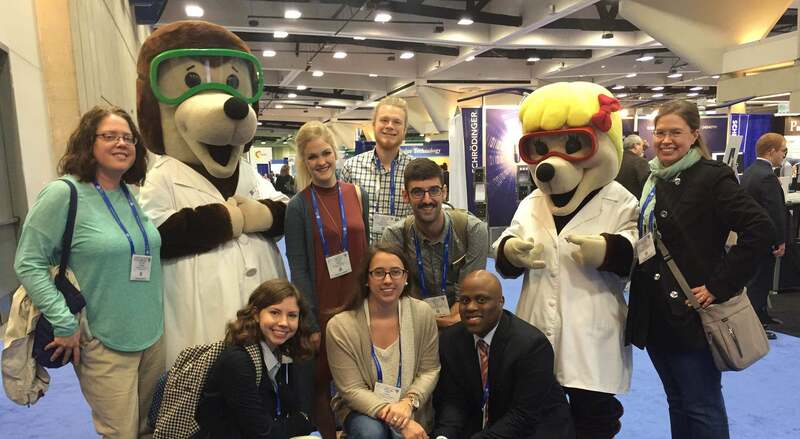 Belmont faculty and students recently attended the American Chemical Society (ACS) National Meeting in San Diego, California. This meeting attracts an estimated 11,000 to 13,000 chemists, chemical engineers, academicians, graduate and undergraduate students and other related professionals. During the meeting, scientists present new multidisciplinary research, hear the latest information in their areas of professional interest and network with colleagues. Chemistry faculty members Drs. Rachel Rigsby and Alison Moore-Parker attended the conference along with nine students who presented eight posters and gave presentations. Ryan Agh gave an undergraduate research talk titled “Towards the concise syntheses of selenium- and tellurium-containing tryptophan analogs for the elucidation of protein structure and function.” Agh’s research was done under the mentorship of Duane Hatch, assistant professor of chemistry, as part of a grant Hatch received to do research at Los Alamos National Labs. Agh also presented Belmont’s Student Members of the American Chemical Society (SMACS) chapter poster, “Belmont student members show the community that science is awesome”. Assistant Professor of Chemistry Dr. Justin Stace had two students present work in inorganic chemistry including Bailey Rose’s “Ligand exchange reactions of an enzyme-mimic Schiff-base copper (II) complex” and Caroline Williams’s “Ligand-exchange reactions in biomimetic model coper (II) Schiff-base complexes.” Daniel Beagan received funding to present “Synthesis of a multi-electron transfer reagent using click chemistry,” work he did as part of a Research Experience for Undergraduates at the University of Cincinnati. Belmont’s SMACS chapter received an Honorable Mention award for the 2015-2016 school year and had a photo selected for publication on the ACS website.